2016 Alaska Off the Hook Adventure! Men! 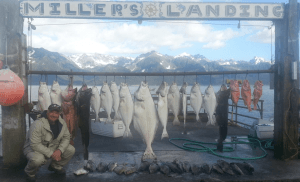 What happens when you combine fishing in Alaska with cutting edge discipleship training? The result – A life changing, unforgettable adventure! Come to Alaska with Brent and Chris from MenMinistry.org and experience not only the amazing beauty of Alaska, but also an Off the Hook adventure discipleship training that sets you free! What will the weather be like? Expect daytime highs to be in the mid to upper 60’s with nights dipping into the upper 40’s. What kind of clothes and shoes do I need? Dress in layers. Rely on a base layer followed by a light fleece or polypro jacket. Do not wear a cotton base layer. It will rain at some point so you must have reliable rain gear, top and bottom. Jeans are fine but don’t rely on cotton shirts. Wet cotton is a poor insulator. For footwear you can wear tennis shoes but you also need something with ankle support and waterproof. A light hiking boot is a good choice. You will also need a reliable pair of hip or chest waders for fishing. Recommended, but some of these items you can rent from ABC Motor Home rental when you arrive. We usually bring our own. You will also want to bring toiletries and/or meds. What will the days look like? Most days will be filled with lots of fishing and/or sightseeing. There will be selected days where groups can go on their own including deep sea fishing out of Seward, Alaska using Miller’s Landing. Is there a place for daily showers? There are public showers at the campground for $5.00. You can take a shower in your motorhome, but I recommend you take them in the shower house as you can run out of water quickly in your motorhome with multiple showers. Is there a store or Wal-Mart nearby? We will load up our motorhomes with food and supplies at the Walmart in Anchorage before we leave town. There are a few smaller supply stores near the campground if you need anything. Can I use my cell phone? Yes, there is some cell phone coverage but can be spotty. The airline will allow as many as you want to pay for. We strongly suggest one 50# bag and a carry on. You can get away with a small daypack (they consider this your lap top bag) plus you’re allowed a roll-on bag as your carry-on. The airline will charge you for each checked bag. Remember you WILL be bring fish home with you so check with your airline to see how much a second bag is. Typically the second bag is $35.00. Will we have any time off during the week to see Alaska? Yes. We have designed in time when you can see Alaska. There are magnificent glaciers, gold mines, hiking trails, river boat or raft floats down the Kenai, and bear viewing on the Russian River close to our campground. How will we get to our motorhome rental location in Anchorage? Does ABC Motorhomes require early registration or booking? When do we do the discipleship training? Because the weather can change in an instant in Alaska and we want you to get in as much fair weather fishing and adventuring as possible, the days and times for discipleship training will vary. Some evenings we will gather at a The total cost of the trip will be somewhere between $1,700 and $2,000 depending on how much extra you want to do while there such as deep sea campfire for life and death stories and teaching. The total cost of the trip will be somewhere between $1,700 and $2,000 depending on how much extra you want to do while there such as deep sea fishing out of Miler’s Landing in Seward. How far away from Anchorage is our primary fishing location? We will be fishing close to Cooper Landing which is 101 miles from the airport. For those who want to go to Miller’s Landing in Seward for a day of deep sea fishing it’s an additional 47 miles. Is there a store or Wal-Mart nearby? We will load up our motorhomes with food and supplies at the Walmart in Anchorage before we leave town. There are a few smaller supply stores near the campground if you need anything. Each man will be responsible for getting his own food, fishing license, gear, etc… before leaving Anchorage. Food costs for stocking your motorhome should run about $100.00 per guy. Out-of-state seven day fishing license is $55.00. If you want to fish for kings, you have to purchase the stamp which is $10.00 for a day, $20.00 for three days, and $30.00 for seven days. Flights to AK will range from $680 to $750 if booked early. Extra baggage fees: This will depend on your airline carrier. Check with them beforehand. Many airlines charge $25.00 for the first bag and $35.00 for the second bag with a weight limit of 50 pounds per bag. Be careful of going over that limit as those fees can be extravagant. The cost for the Adventure discipleship training is $300.00. Whatever fishing gear want or need to purchase. (NOTE: You and your team are responsible for booking your saltwater charter ahead of time and are responsible for any cancellation fees. Please review their policy at the above website. I hear Alaska is full of grizzlies that are roaming around waiting to chew your ears off…is that true? Not exactly. Although bears are everywhere they are typically afraid of humans. I would recommend purchasing bear pepper spray at Walmart in Anchorage before we depart. If you have a handgun or 44 caliber or larger you might want to bring that. Alaska is an open carry state. For information on how to bring your handgun through TSA go to the TSA website.